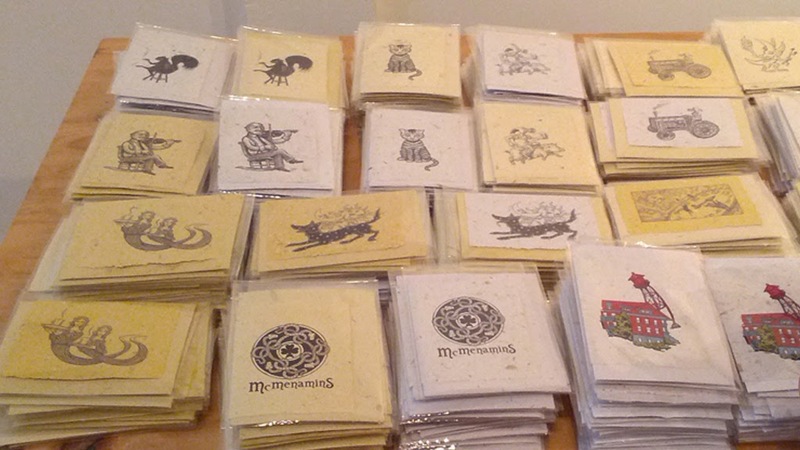 We primarily make paper for demos, workshops, and our personal artwork. When we first started up we made larger custom wholesale orders, but we have shifted gears and prefer to work on custom orders for artists and creatives. We love working on unique projects that highlight sustainability in papermaking, using waste products to create unusual handmade papers. We also enjoy using flax, hemp, mulberry, mitsumata, gampi and abaca, though we order these fibers from papermaking suppliers rather than sourcing them locally. Our papers are made using either Western or Eastern techniques, depending on the fiber and desired use of the paper. Our largest custom order size is currently 22x30". We can make smaller papers in the 16x20", 12x15", 11x17", 8.5x11" ranges. You can use our papers for fine art applications like printmaking, bookmaking, letterpress printing, painting and drawing (we sure do! ), but you can also use them for fun scrapbooking projects, for letter writing, or journaling. Depending on its intended use, our papers can be heavy duty and thick like cardstock, or thin and wispy like tissue paper. We only make custom orders seasonally September - April, please keep this in mind before contacting us. Email us to discuss your custom needs and get a price and time quote. Are you curious about how we turn old t-shirts and plants into paper? Check out this video of our Hollander beater in action! We will begin offering small batch fiber processing services in fall 2019. Check back for info. Here's a few things we've worked on in the past outside of our educational and artist residency offerings. Enjoy!